Methods of Female Oviposition: Open Screen Cages; This brief video shows a female indra laying an egg in an open screen cage. Placing host between rocks in a cage seems to help. How to Find Eggs: Eggs on Peripheral Stalks; Seek out host plants that are exceptionally healthier than other sun-scorched plants within a population. 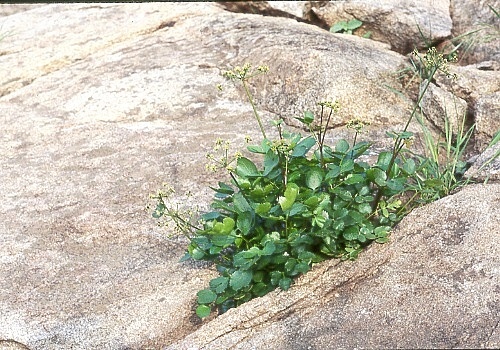 This usually equates to plants situated between rocks. Females will lay eggs on these types of plants. How to Find Caterpillars in the Field: Once you understand where Papilio indra females prefer to lay eggs, the key to finding caterpillars has a lot to do with understanding and recognizing the progressional change in caterpillar feeding damage and resting preferences as caterpillars progress through its instars. Caterpillar Feeding Damage: See this slide show. Look for unique first instar skeletonizing chew marks on stalks where eggs are likely to have been laid. Third instars rest at the base of the plant whereas late instar larvae "strip down" the host plant leaves; but leave the central stalk in tact. Caterpillar Resting Positions: See this slide show. First instar indra larvae rest up-side-down on the stalks of its host plant. Third instar larvae tend to move away from the periphery of the host plant to rest at its base. Fourth and fifth instars rest at the base of the host or off the host altogether. Larva to Pupa: Larva purges and wanders. Post-Hibernation Strategies: Expose Pupae to warmer temperatures; Long-Day Photoperiod; and High Humidity. Disease Prevention: Critical for P. indra! Some information is provided in Utah Lepidopterist. Field Notes: Dr. Wayne Whaley has done extensive research on the entire Papilio indra complex. Click here for more information on the Utah West Desert segregate of Papilio indra from Wayne's site. Click here for more information from the Utah Lepidopterists' Society website.